Funded by the UK fashion reuse charity TRAID, this project brings together Cambodian workers and activists with British filmmakers and campaigners. Garment workers created a citizen journalists’ group in June 2016 with Cambodian workers’ rights group Central. Mentored by film production company Rainbow Collective and supported by UK campaign group Labour Behind the Label, these garment workers are now equipped to tell their own stories and lobby for change in their factories. The team found early success this year when graphic photographs of workers scraping their skin with coins (“coining”), to cool down from the intense heat in factories, led to the installation of air conditioning systems by an Italian brand sourcing from the factory. The films reveal how the workers struggle to provide for their families, risk their health in unsafe conditions and put themselves in danger just by travelling to work, which due to their low wages is often done in goods trucks. Thousands of workers were killed in traffic accidents last year alone and unions are calling for factories to provide safe transport for their workers. The films will premiere at London’s Platform Theatre in Southwark, as part of Brainchild’s Platform for Film event on Sunday 27 November during fashion reuse charity TRAID’s #Secondhandfirst Week to an audience of activists, NGO representatives, journalists and the general public. The films will then be available online. 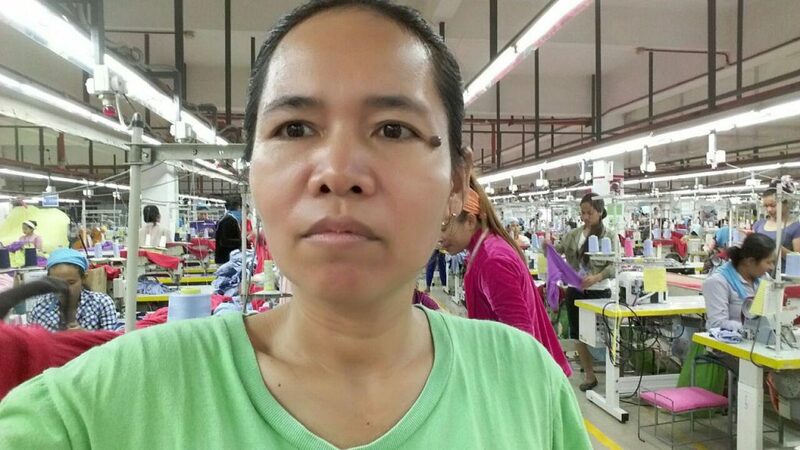 The citizen journalists initiative is part of a wider project to give garment workers a voice through training workers and organisers, and raising awareness. Through providing legal aid and training, Central have secured compensation for workers, new unions have been set up and existing unions have seen significant increases in membership, which means workers are increasingly able to claim their rights. Labour Behind the Label is the only UK campaign group working exclusively on labour rights in the global garment industry, and is the UK branch of the international Clean Clothes Campaign. We raise public awareness and promote collective action from consumers to push for change in the industry. We pressure companies to take responsibility for workers’ rights throughout their supply chains. We work with trade unions worldwide to amplify garment workers’ demands. We lobby governments and policy makers to legislate and protect garment workers’ human rights. The focus of our work comes from garment workers themselves, and we provide a platform to amplify their voice and demands and to promote international solidarity. TRAID is a charity working to stop clothes from being thrown away. We turn clothes waste into funds and resources to reduce the environmental and social impacts of our clothes. It is a circular and sustainable approach to the problems of clothes waste tackling disposal, production and consumption by: increasing clothes reuse across the UK, reducing waste, carbon emissions and consumption; funding international development projects to improve conditions and working practices in the textile industry; educating people of all ages about the impacts of textiles on the environment and people’s lives, and how we can make more sustainable choices. Rainbow Collective is a documentary production and training company formed by Hannan Majid and Richard York as a social enterprise focussing on issues of human and children’s rights. In addition to producing broadcast and cinematic documentaries, it is the goal of the Rainbow Collective to support, promote and facilitate national and international campaigns for social equality and the right to education. Rainbow Collective’s acclaimed and award winning films have been seen by audiences around the world through broadcast and international festivals, and their students work has been screened at the BFI, the House of Commons, Amnesty International, Odeon Cinemas and the Equality and Human Rights Commission. For the past 5 years, Rainbow Collective have devoted much of their time to producing films and campaign materials around the garment workers of Bangladesh. Central is a Cambodian organisation which empowers Cambodian working people to demand transparent and accountable governance for labour and human rights through legal aid and other appropriate means.